The Association for the Study of Peak Oil-USA's conference in Washington DC, "Peak Oil, Energy, and the Economy" will be held next week. There is still time to register. Details are available on ASPO-USA's Conference Website. The main presentations are on Thursday and Friday, November 3 and 4. On Wednesday, there will be an optional meeting with Congressional Staff to discuss energy issues. Special roundtable and workgroup sessions will be held on Saturday. Many of the speakers will be familiar to readers of The Oil Drum. ASPO-USA also prepared a letter calling for Truth in Energy for Energy Secretary Chu; held a press conference October 26, to present the letter to the Department of Energy; and issued a press releases on some of the issues we are now facing. Below the fold, I show the press release and the letter to Secretary Chu. As concerned citizens, and representatives of the Association for the Study of Peak Oil & Gas USA (ASPO-USA), we the undersigned believe that the Department of Energy (DOE) and the Energy Information Administration (EIA) have failed to critically examine one of the most serious threats to our economy, national security, and environment—the prospect of an impending decline in world oil supply. DOE and EIA have also failed to examine factors that may constrain future domestic natural gas supply, despite the current exuberance regarding shale gas. In our view, these shortcomings to recognize and address supply limits for oil and gas are a major danger to America's economy and national security. The Department of Energy has a key responsibility to help the nation prepare for the growing possibility of an oil supply emergency and long-term oil shortages. We believe that America needs a National Oil Emergency Response Plan and that the DOE should take a lead role in developing this plan. 1. Global crude oil production has departed from its historical trajectory of steady growth and remained essentially flat since 2005, despite a substantial increase in oil prices. 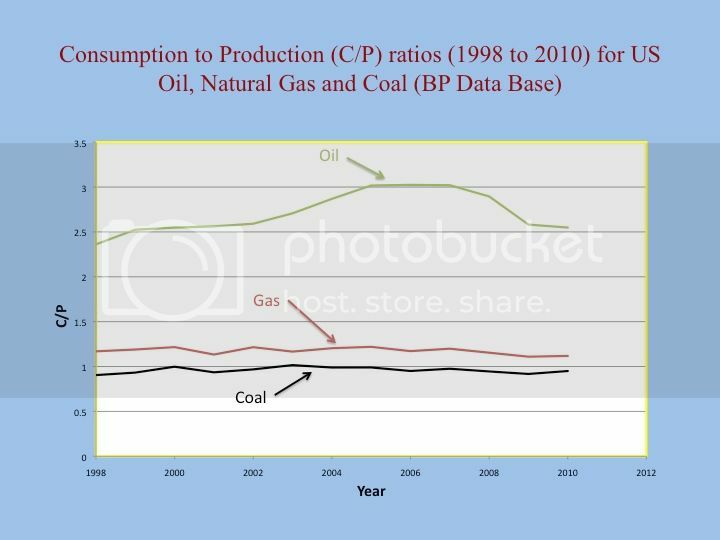 How does DOE explain this trend, and does the change signal an impending decline in world oil supply? 2. The inflation-adjusted price of crude oil has increased far above its historic average and remains very high despite a worldwide economic slowdown. Again, does this development portend an impending a decline in world oil supply? 3. The volume of crude oil exports available to oil-importing countries has been declining since 2005, as domestic demand has increased in many exporting countries. If this trend continues, what are the implications for future oil supply, particularly for importing countries such as the United States? 4. In projecting future global supply and demand for oil and gas, EIA models appear to assume that supply will simply increase to match whatever level is demanded by projected economic activity. How can this assumption be justified in light of the physical, economic, and geopolitical challenges facing oil and gas supply? 5. In projecting future U.S. natural gas supplies, including the growing share provided by shale gas, has DOE addressed the possibility that a large share of these gas resources may require much higher natural gas prices to sustain, let alone increase, production? 6. Has DOE conducted a risk assessment of the consequences of EIA's oil and gas supply projections turning out to be overly optimistic? 7. Unconventional oil and gas resources are providing an increasing share of total U.S. supply. Has DOE assessed the economic consequences of increasing production costs and declining net energy return associated with these resources? We would like to request a meeting, at your earliest convenience, to discuss these concerns and share our perspectives on the development of a National Oil Emergency Response Plan. Also, as you may know, ASPO-USA will hold its seventh annual conference, Peak Oil, Energy and the Economy, in Washington DC, November 2-5. Energy experts from across North America and Europe will be in attendance. We cordially invite you and/or your staff to be our guests. If you or a member of your staff wish to speak at the conference, we would be pleased to accommodate you. Nice sentiment & important work....but Chu already knows this. "They" will take no action unless there is a popular groundswell forcing them in that direction OR the credit bubble bursts & they are forced to address biophysical reality. Until then, such letters are equivalent to yelling at the TV. In the meantime, we MUST accelerate the solar-powered agricultural transition at the community & family level. Time is short & the beast of collapse slouches ever closer. Perhaps we need an Occupy DOE with masses of protesters demanding a stop to the lies concerning the lifeblood of our economy. We need the TRUTH, to be followed by realistic, effective planning. We must demand accountability from government that is supposed to serve the public interest, NOT what serves the best interests of Exxon, Koch Industries and Halliburton, etc. They should protest the Bureau of Economic Analysis while they are at it - for fudging GDP numbers and inflation stats, which impacts income of the 99% (pensions, COLA wage increases, etc.)! Bad stats have been downplaying the hit the 99%-ers have taken over the past decade or two of economic stagnation. I like the Occupy DOE idea. I am not sure that ASPO-USA would be willing to go quite that far though. I like the Occupy DOE idea too. I'd participate provided that it was done strategically. I haven't participated yet in any of the Occupy Wall Street protests, but I've thought to myself that I'd be more inspired to participate if there was more of an explicit peak oil component. I'm not sure either that ASPO-USA would be willing to officially participate. But no matter...it doesn't need to have the official endorsement...it can be an organic movement that's not affiliated with any one organization. "I've thought to myself that I'd be more inspired to participate if there was more of an explicit peak oil component." Make it happen. It may be easier for me in a small town, but I'm going to the GA in Ukiah on Sat. to try to get something going. I'm just not sure what. Wrote a post about PO and the economy with a lot of links to Gail and Jeff, was told to come up with a proposal to present to the bi-weekly GA. Told Todd "I think I have an unachievable goal, so now I just need a plan on how not to get there". I thought the "Occupy" goal could to be make every inland corporate-affiliated building install solar using local labor and corporate money (eg State Farm, not SF agent), and we could get 50 people holding photos of panels to occupy the roof of the BofA. I'm obviously horny to get arrested for the cause. Long term, maybe I can get them to relate energy to growth, and direct them into whatever localization movement they have down there... "instead of a 2nd Constitutional Convention, start up a Grange chapter and grow some food, kddies." I dunno. This is all a very spontaneous, guerrilla movement. I haven't got a clue. It's ad lib. I think it is a political happening, and anybody can be a leader for the day if you put some time into carping the diem. I go find out. Strange things are going on. A Ron Paul guy told me he had been finding common ground with the libs. He went from that to joining the first Drum Circle of his life to buying a drum. I think that daring to risk ridicule and educating others is all we can do. I mentioned in a past TOD post about presenting to classes in my school district where I work. I now have four offers...one of which links two high schools with a potluck (100 mile thing). Why don't you guys offer to put on a presentation at a school? I am sure they have an environmental club, or some such initiative.. Then, get some angry parent writing letters and Bob's your Uncle. What do you want me to do about these trouble makers? Don't worry. We already have our media friends ridiculing anything they say. Keep up the good work, chu chu. There's a million $ job waiting for you after you leave government. Your Swiss bank account is getting a nice Christmas bonus right now. Jim Cramer on CNBC this morning: "We will be a big net exporter of energy, even as we import energy from OPEC." We are just barely self-sufficient in coal, consuming 95% of production in 2010, and a few years ago, we were a net coal importer for a year or two. In 2010, our natural gas consumption exceeded production by 12%, and our oil consumption exceeded production by 155%. You forget, the forecast is just that we will be a big net exporter. I mean, if we stop all economic activity, stop driving, stop buying anything (all b/c we have no money - except the top 10% or so), we become a third world country. then our energy use will drop to next to nothing, and whatever oil gas and coal is left, well, we can sell it to the Chinese, Indians, etc. Not that Chindia will have an economy left either. Just that we can sell energy to them if we stop using it. Watching events as they transpire, I see we are eliminating labor as a cost component of everything. Rigging elections will be much easier; just limit the number of polling places. Poor people won't be able to get to the polls. Rich people will rule (even more than is already the case) and will use eminent domain to sieze all resources they want for production, construction, etc. The only factor I can see that they are missing is consumers... I have had conversations with dedicated Chicago School and Austrian School adherents who tell me that there is no connection... no whatever... between laborers and consumers. Consumers, they tell me, will buy whatever they produce and advertise. If they don't have money, they will borrow it. Never mind that they don't have jobs, they will mortgage their houses, borrow on their cars, and take out payday loans (very questionable how they do this with no jobs, but I have been told by some otherwise very smart people that this is how it will happen). Apparently the law of supply and demand means, if they create a supply, the demand will follow. All except oil. There, demand will create supply! Ron Suskind claims a high Bush aide (sometimes attributed to Rove) said, "We are an empire now. We create our own reality." Evidently this belief is still in vogue. He knows - and so do most all heads of state. I find it odd that more don't discuss peak everything or overshoot. What was it; 45 meetings to "solve" the Greek thing? And they could only come up with massive write-offs and a trillion more fairy-dust dollars?! It's not that odd, Roccman, not really. 'Coz they know the "solution" to peak oil lies in a completely opposing direction to BAU. And that's an impossible deal to make while there's still a can to be kicked down the road. Merkel Won’t Let Euro Split, May Cause Dark Age. Angela Merkel won’t allow the euro region to split because she understands that could cause “a dark age” by wrecking the bloc’s energy markets as oil supplies dwindle, said an adviser to the German chancellor. Europe’s 500 million residents, the wealthiest market on Earth, have led the development of technologies in clean energy, transport and communications that can drive global growth that doesn’t rely on oil, said Jeremy Rifkin, a Wharton Business School professor who has advised Merkel for six years. That was a very interesting article. At the end it became a little bit of a PR shout for Jeremy Rifkin's new book The Third Industrial Revolution. This book, soon to be released, claims that we will all have our own energy collecting technologies at home and use of lots of batteries to prompt further growth in the economy. Hmmmm----let's see.....the sun isn't getting bigger or shining longer.....hmmmmm.....growth?? And what kind of energy collecting technoloogies is he talking about? Plum trees? Corn stalks? Wheat fields? Probably not---those aren't interesting technologies that can be made by companies. There is an operational capacities demonstration of a 1 megawatt steam boiler using cold fusion reactions conducted against the specification of a well-known but as yet undisclosed large industrial company, to be conducted on October 28, tomorrow. There have been solid indications of excess heat production that have been observed in unit tests of one sub-module of the 53 that comprise this reactor. If the test is successful and the prototype is accepted, manufacture of units based on this prototype will begin directly. Please post us in how this experiment turns out. If I am doing the math correctly, each of the 53 modules will need to produce 18.86792 KW in order for the entire machine to produce 1 MW? I would hope that there were solid indications of excess heat production from that test module representing 1/53 of the total number of modules in the system! I will be interested if and when this device's performance is replicated and verified by several independent review groups. Probably the biggest opening for skeptics will be the continually running genset that is probably rated for 500 kW (my guess), and appears to have been connected by cables to the E-Cat. "Where's the mystery?" So knock yourselves out, skeptics. It's the customer who has to be happy, and apparently this one was satisfied that those cables were not contributing to the 470 kW output during self-sustaining mode. Is this customer a plant? There are indications that the customer is some entity or branch of the DOD; for an American, this is the very best of news. If the customer is a military organization (the US Navy, DARPA), the security apparatus of the associated country (the US) is now available in all its varied and potent forms both known and clandestine to protect the Rossi technology. Spy and stealth planes--many with bizarre, bat-shaped wings, others with triangular silhouettes that inspirer otherworldly designs in the minds of the general public--have long been cultivated by the military: the defense intelligence agency and the CIA. UFO sightings and lore and their official denials, feed rumors that the government isn't telling us about alien ships. The CIA estimates that over half of the UFOs reported from the '50s through the '60s were U-2 and SR-71 spy planes. At the time, the Air Force misled the public and the media to protect these Cold War programs; it's possible the government's responses to current sightings of classified craft--whether manned or remotely operated--are equally evasive. The result is an ongoing source of UFO reports and conspiracy theories. The armadas of secret Earth-built Air Force craft that have likely have lit up 911 switchboards over the years remain largely unknown in the minds and lives of the general public. Cold fusion is the ideal framework for a similar campaign of disinformation as a cover for advance Ni-H powered weapons systems. Rossi will quietly fade from the scene; while the US government paints anyone that believes that cold fusion is real as a kook, not only to protect defense secrets but to maintain the economic continuity of the fossil fuel economy that has served the US so well from disruptive turbulence. In a few decades, when the oil is much depleted and the natural gas from US shale deposits are petered out, cold fusion will emerge from the shadows of the skunk-works defense labs to continue the hegemony of the US and its oil producing allies. For all of us who own substantial holdings of oil and gas stocks, this is good news…the best. We can anticipate continued lucrative distributions of dividends into the indeterminate future with no prospect of disruptions or diminishment. Hmmmm----let's see.....the sun isn't getting bigger or shining longer.....hmmmmm.....growth?? The solar energy reaching the earth's surface is about 7,000 times the total global energy consumption. Global energy consumption in 2005 was only 0.014% of the solar energy reaching the earth's surface. "Below the fold, I show the press release and the letter to Secretary Chu." Further below the fold, Rat points out that Google News has a 2 day old announcement that there will be a press release, and Google has 3 stories from the Energy Bull and 2 which link to them. Nothing on TV. Maybe I'm looking in the wrong places and listening to the wrong news shows, Maybe we need a real Occupy DOE, with real arrests, which gets real coverage. Ask James Hansen. If y'all will do an Occupy DOE, and conduct a sit-in or something and get arrested, Rat will change all my plans and head back there and put my body on the line with you. It's the only thing that's really gonna make a difference. What ever happened to "the fierce urgency of now"? Google has two separate sections--news and web. Our posts go up as "web", unless we add the word "original" to the tags, as I understand it. I think most of the blogs and other groups that wrote about the ASPO-USA activities show up on the "web" rather than "news". These are the web search results for "ASPO Secretary Chu" (without the quotation marks). There are several items, starting with The Oil Drum, but none of them are the "regular media," like the New York Times. There is only one item in the news search--the PRWeb press release, put out by ASPO-USA. Checking in Google for "ASPO-USA Press Conference" in news, the results are a little better. The Oil and Gas Journal has an article, "EIA shale predictions need closer scrutiny, peak oil group says." There is also the same press release as the Secretary Chu item. There are also several items on the Web search, starting with The Oil Drum post. Of course, part of the intended impact is at the Dept of Energy, and that could occur, with or without other publicity. Also, when the conference is actually in town, it may be possible to get more into the news. Last year there were at least a few people at the conference from various organizations in Washington DC, from API, to the IMF to various government related people, and the hope is that there will be even more there this year. Yesterday, seven congressional candidates brought the energy of the Occupy movement straight to Capitol Hill. They marched on Speaker John Boehner's office with 35,000 petitions saying "We stand with the 99%" -- and demanded that Congress pass jobs legislation now. With news cameras from CNN, NBC and CBS in tow, a fascinating clash with Boehner's staff occurred. re: "You're supposed to bring kids with their facebook twittering things too." I think ASPO is asking for volunteers, including for publicity. It's too bad we're going to have to go thru a lot of pain before we start making any fundamental changes. By then it will be way too late for us in the USA. Ignorance has a price. I'm a fan of Chu's work. But this letter is a good thing . . . hold his feet to the fire and let him know that people are aware of the issue and want him to work on it. But I gotta say, the guy is already in hot water these days for being too forward leaning. The Solyndra bankruptcy is a minor (mostly bogus) scandal. And recent studies have been saying that painting roofs white may be counter productive. The loan to Fisker also just got spun into an issue (by people using misinformation). Enerdel got DOE money and they are hanging on by a thread. A123 has seen their stock plummet. These were bets that may have worked out very well if the effects of peak oil had hit us hard already. But so far, we are just at plateau where oil is much more expensive than it was but it is still too cheap to allow alternative to get a good foothold. See my post a few Drumbeats back with tests on tiles. ... as long as the accountants who are supposed to account for everything keep not accounting for the "externalities"
Hope that this will lead to something, do you also send it to all majors media organisations ? Could also be to non US ones, like all majors Europeans newspapers, or TV channels. Otherwise seems to me that a key characteristic of our time is that this fossile energy issue is almost always adressed to the general public through the CO2 and climate angle. And I am not an AGW denier at all (neither an expert in climate science), but clearly a certain balance should be brought back between the PO/resource depletion aspect and the CO2 aspect in the communication towards the general public* (especially considering that the mitigation measures work for both most of the time, except for stuff like CCS which I consider a typical "false good solution" anyway, due to the 30 or 40% efficiency loss in ressource usage). *A typical example of this communication deficit : if you consult the report about the "carbon tax" that was discussed in France late 2009 (and the whole thing further dropped), the ressource depletion aspect is alluded to in one and half line or something, whereas when the TIPP (volume based tax on gas making the tax part of a litre of gas around 60%) was set up after first oil shocks, nobody was talking about CO2, but the measures were taken (and the results there, average car efficiency much better in Europe than in the US for instance). "The president is committed to investing in clean energy [but] we must also ensure that we are strong stewards of taxpayer dollars,"
I'm very pleased to see this issue revived. As has been mentioned in the past, planning for and administering Liquid Fuel Emergencies (LFEs... Australian term... their work is the most comprehensive & most current) is extremely complex. It also requires extensive preliminary work, especially on the legislative/legal front. The most fundamental issue is whether government intends to get involved in the first place. The current thinking seems to be that government should stay out of it and allow "full price pass-through" to do its job of reducing demand during a supply crunch. In this case it would appear that we may not need much of a plan: industry owns the fuel and the infrastructure which supplies it, and it has the expertise. Consumers will simply have to trust them to provide fuel as efficiently and equitably as they can. That said, the effects of a severe oil shock could be so pervasive and so profound that it would surely become the #1 issue at every level, and governments at every level would be struggling to deal with its disruptive effects to employment & commuting, prices & supply chains of such essentials as food & medicine, etc. The threat to social order should be obvious and the strain on first responders would be entirely predictable. The GAO did extensive work on the US Gasoline Rationing Plan for many years and at one point mentioned, "It is questionable whether an adequate organizational structure exists which could effectively manage a [major oil supply] crisis" (GAO, 1981). They are almost certainly correct, and our best hope for managing such a massive problem may lie at the local/municipal level. The UK took some progressive steps to 'localize' their emergency response capabilities following their Sept. 2000 fuel emergency. There has been some criticism that the new UK model is a 'paper shell' that lacks substance, but there does seem to be some merit in the model itself, and we have to start somewhere. Ironically, there does not seem to be a city in North America that has an LFE/oil emergency plan apart from its own internal plan. None of the cities which I've contacted had a plan to administer/allocate fuel to their public. However, prevention of panic buying is surely a vital component in preventing an already difficult situation from quickly becoming much worse: in the UK, local fuel supplies which could have lasted 4-5 days were sometimes drained in less than one day (with the additional problem of dangerous storage). Furthermore, municipal officials said that they had no legal authority to interfere with the sale of fuel to the public, nor did they believe that there would be much interest in exploring the matter. Canada and the USA both need to revisit the issue of LFE planning, including the involvement of Public Safety Canada and DHS. There is much that we can learn from those old GAO documents, the UK model and the research of Alan Smart in Australia. The problem seems overwhelming, but there are a few sensible guide-posts out there: we need to examine & build upon them. Why are we so afraid to call out a public servant for hiding the truth? This is disgraceful that we should permit one of the Nation's Hired Help to distort the truth for purely political puposes. When the truth and political purposes come in conflict honest people resign. If they claim the field of science as a disciplinew it is imperative. As one of the folks who helped create the City of Portland's (Oregon) Peak Oil Task Force (www.portlandonline.com/bps/index.cfm?a=145732&c=42894), I'd suggest checking out LEAP, the Local Energy Assurance Program (www.energyassurance.us). It's US Dept. of Energy project that partners with the local Emergency Management Office for how to handle energy supplies after a large disaster. Here is the website for the project in Portland, OR - (www.portlandonline.com/oem/leap). Of particular note, the 1st presentation on the 1st day of PDX LEAP was a fairly detailed presentation about the City of Portland's Peak Oil Task Force report. Just wanted to add that I bring up LEAP as a possible bootstrap to a more comprehensive oil emergency plan, but would point out that I view LEAP as an acknowledgement that as a society we are basically energy illiterate, doubly so after a large disaster. I've been able to have considerably more in depth conversations about peak oil and energy shortages in general with a broader cross section by talking about how as a community we recover after a large disaster. re: "I've been able to have considerably more in depth conversations about peak oil and energy shortages in general with a broader cross section by talking about how as a community we recover after a large disaster." I also wonder if oil shortages could be included as one of the named disasters? (i.e., oil shortages - temporary and permanent.) Just as a start. Also, wonder if CERT meetings and training might be another way. There's an awful lot of CERT training going on - none of it covers the oil/fuel shortage scenarios, though. Not that I've heard of, anyway. Is there a video of Robert Hirsch talk in front of the DOE ?